After a year and a half of major renovations, our flagship 54’ Bertram, OVER UNDER is back in action. Capt. Joe and our newest crew member Capt. David Proctor have OU settled into Treasure Cay for the Summer Season. 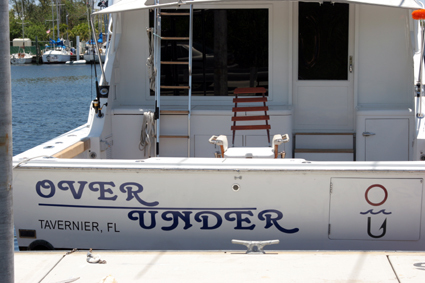 Over Under is available for day trips, week long charter, or 3 to 5 day packaged fishing, snorkeling, and cruising trips. With three state rooms, 3 bathrooms, and a full galley, this boat is ideal for island hopping in the Abacos. Capt. David Proctor brings a wealth of experience having fished and cruised extensively throughout the Bahamas over the last 5 years. If you are looking for a last minute Summer get-away for the family, we hope you’ll consider the Abacos, and give us a ring. 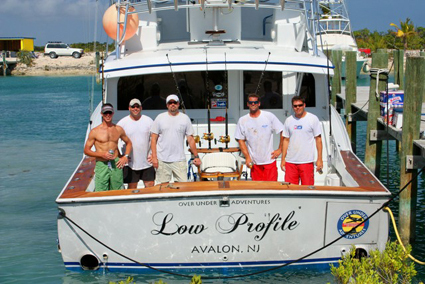 LOW PROFILE finished up its Bahamas season filming an ESPN2 show with George Poveromo in Cat Island last week. The fishing, while not fantastic was certainly decent. Plenty of dolphin are to be had, and the Yellowfin Tuna finally showed in good numbers. The sharks were fiercer than normal and made it tough to get the tuna to the boat unfortunately. The billfish bite had slowed, but we still managed to raise one a day. The last few days have been plagued by bad weather. A system seems to have parked itself over central Florida and extends all the way over to the Abacos. We have not fished in the last 5 days, but are hopeful that we can get back at it starting Monday. So for today, Nippers it will have to be! OVER UNDER is fishing out of Sea Spray Marina this week on Elbow Cay while LOW PROFILE is getting some well deserved TLC in Palm Beach, before heading off to NJ for the season next week. Captain John is currently on a three day Dry Tortugas trip. Please look out for this report on Tuesday. Tight Lines! Memorial Day Weekend is here and the Flounder bite in the back bays has turned on nicely. Reports of up to 20 flounder in 2 hours, with plenty of keepers mixed in, were reported. In the Delaware Bay, the Drum bite is again on fire. Capt. Bob reported to catching 14 Drum Friday afternoon. Along the beach, things are still a bit slow, as the water temps are still quite cool. Plenty of bait is around, so it shouldn't be long before things bust open on the wrecks and lumps offshore. Reports from Mitch Roffer about the offshore action are quite tempting. Roffers reported that both Bluefin Tuna, in the 150 pound class, as well as swordfish were being caught offshore of the Wilmington and Baltimore Canyons. Indeed there is a pocket of warmer water out there that seems to be holding some Pelagics. Shark action should quickly begin over the next week or so, as folks begin to venture offshore in search of some enormous temperature breaks that are located around the 100 fathom curve. Over Under is pleased to be able to offer our customers the ESKIMO ICE Machine. This unit comes in two models, capable of producing up to 250 or 600 pounds of ice per day. 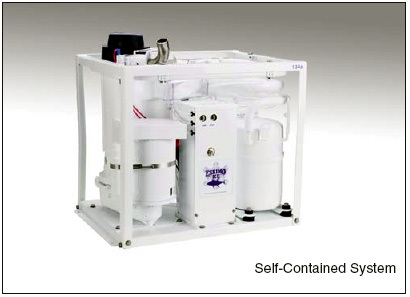 The Eskimo Ice system produces fresh water ice, and is salt water cooled. A great addition to your Sport Fishing Boat. Kits include the unit, digital control and sensor, pump, and ice thru hull. New Updates for Bahamas and Florida Keys Fishing! Take a listen to this week's reports and listen first hand what's biting! Follow us for up-to-date audio and fishing reports on what we're catching on a regular basis. Search "fishoverunder" and follow us today!! !